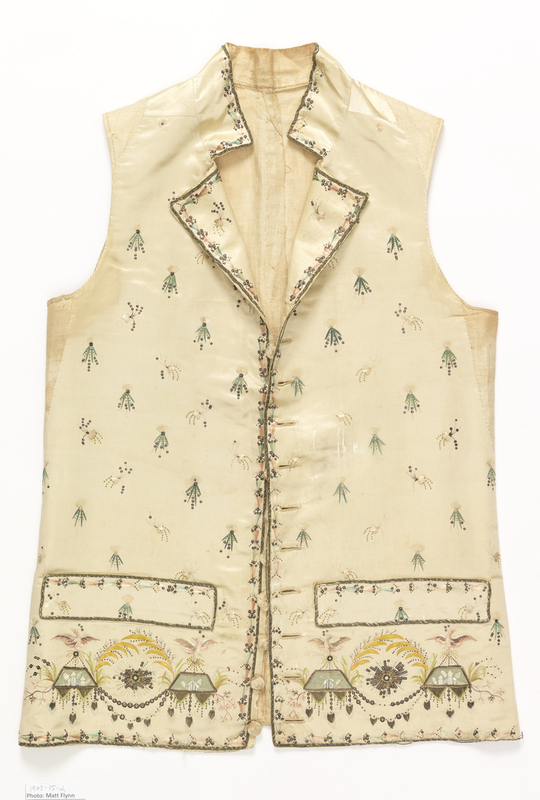 The light color palette and spare decoration of this waistcoat are typical of the neoclassical style, which dominated design in the late eighteenth century and early nineteenth century. The silhouette is tight-fitting and markedly angular, with the lower hem cut straight across and rectangular pocket plackets. This was a departure from the skirted waistcoats with curving pocket flaps of the preceding Rococo period. Although restrained in decoration, the garment implies luxury through the inclusion of metal-wrapped silk, paste jewels and metal sequins. Starbursts and phoenixes enliven the design. Stylized floral motifs with silver spangles have replaced the naturalistic sprays of flowers that had been popular earlier in the century.